I would be lying if I told you that I didn’t have a massive, industrial grade shoe rack filled with footwear [à la the clearance racks you see at Macy’s]. I would also be fibbing if I told you that each spare closet in my house doesn’t store my off-season wardrobes. And, would you believe that I have a pretty sweet store of handbags as well? While I don’t believe that I belong on an episode of A&E’s Hoarders [my husband might tell you otherwise], I do admit to a fixation with fashion – fashion on a budget, that is. I don’t pay retail prices for a darn thing. Shopping for clothing is like a sport for me. I’m regularly equipped coupons, special sales, rebates, ad circulars, Googled promo codes, and even credit card perks. And my goal is to score high quality [sometimes even designer tier] apparel, shoes, and/or accessories at rock-bottom pricing. I even bought my wedding dress on sale…and used a coupon on top of that. As it turns out, I’m not alone. 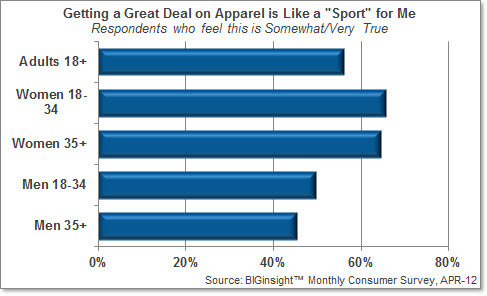 According to the latest BIGinsight™ Monthly Consumer survey*, the majority of consumers agrees that “getting a great deal on apparel is like a ‘sport’ for me” [56.1% say this is somewhat/very true]. This number rises among both females 18-34 and 35+ and is a near-majority for men as well. But that’s not to say that all consumers enjoy the thrill of the hunt. While nearly a third say that “shopping for apparel is one of my favorite pastimes” is somewhat/very true for them, a larger proportion (43.8%) indicated that this was not very/not at all true. 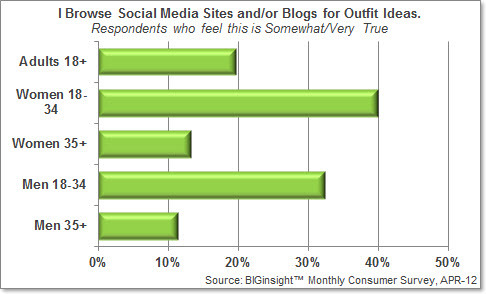 In fact, among men over 35, nearly half (44.5%) would go as far as to say that “shopping for apparel is a necessary evil”! In this age of smartphones, tablets, and other technological advancements, one might think that catalogs and other print media are a bit passé, but those hunting for fashion ideas might disagree. Nearly half (48.1%) of shoppers responded that they “enjoy looking through catalogs, direct mail advertisements, and circulars for apparel.” This number rises substantially among women 18-34 (61.9%) as well as their 35+ counterparts (57.2%). But when it does come to new technology, it’s the younger shoppers (18-34) who are surfing sites for fashion trends and tips [some of my personal faves are here, here, and here]. In this age group, two in five women (40.0%) and – surprise! – nearly a third (32.3%) of young men say they “browse social media sites and/or blogs for outfit ideas.” Among those over 35, this figure drops significantly. – Nearly four out of five women 18-34 (78.5%) “enjoy shopping for apparel sales and discounts,” while the majority of young men (55.2%) feel the same. – While women 18-34 (56.9%) and 35+ (47.8%) are the most likely to “try to re-create high-dollar looks on a low-dollar budget,” a large proportion of young men (46.1%) are inclined to attempt this as well. Men over 35? Not so much (29.2%). UPDATE: For more on this topic, click over to our press release: Special BIGinsight™ Analysis Identifies Behaviors and Shopping Strategies of Apparel Shoppers. 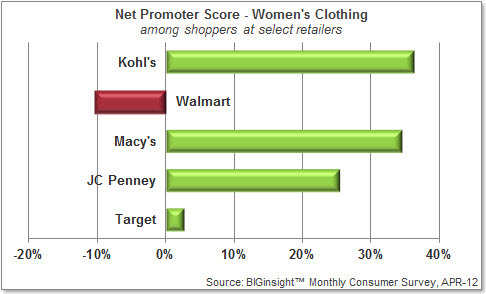 Includes analysis of Kohl’s, JC Penney, Macy’s, Target, and Walmart Women’s Clothing Shoppers. * Respondents were posed the following question: On a scale of 1 (“Not at All True”) to 5 (“Very True”), please tell us how true the following statements are when it comes to shopping for apparel for yourself and were presented with a variety of fashion and apparel oriented statements. A sampling of these statements appears within this report. The older, the wiser? As it turns out, members of the Silent generation are the most acutely aware of increasing food prices; nearly 90% of those born pre-1946 say they’ve witnessed rising prices in this category over the past 30 days. Almost as many Boomers say the same (82.0%), while awareness decreases among Gen X (69.9%) and Gen Y (53.7%). 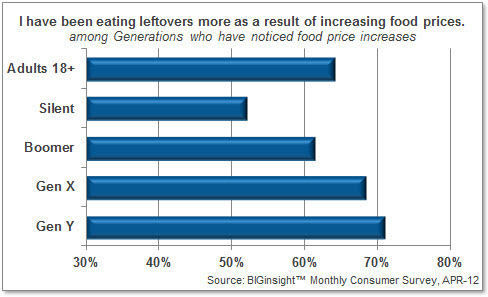 Gen X, Gen Y are hitting the reheat button: Among those who have noticed rising grocery prices, those in the younger generations are the most likely to be saving leftovers for later – that’s 70% for both the Gen X and Gen Y groups. This rate reduces to 61.4% for Boomers, while Silents (52.1%) are the least likely to be squirreling away last night’s supper. – While Coffee is one of the least likely items to be removed from the regular grocery list, Gen Y-ers (16.0%) are three times more likely to forego the caffeine fix compared to Silents (5.3%). – Magazines are a “top 5” cutback for the two older generations, while Gen X and Gen Y are at least 25% less likely to sacrifice the latest gossip, fashion trends, and – of course – worldly events. – Organic foods become more important as age declines. 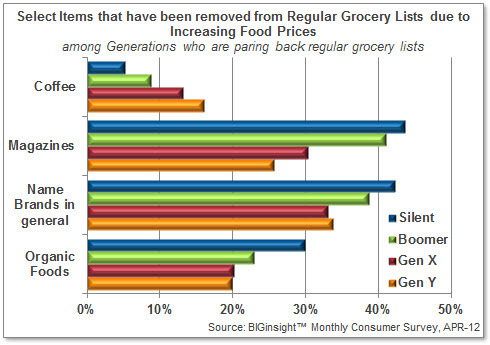 Nearly 30% of Silents say these items have fallen from their regular grocery lists due to increasing prices, while that number is just 20% for the Gen X and Gen Y groups. – The older the generation, the less important the brand name. 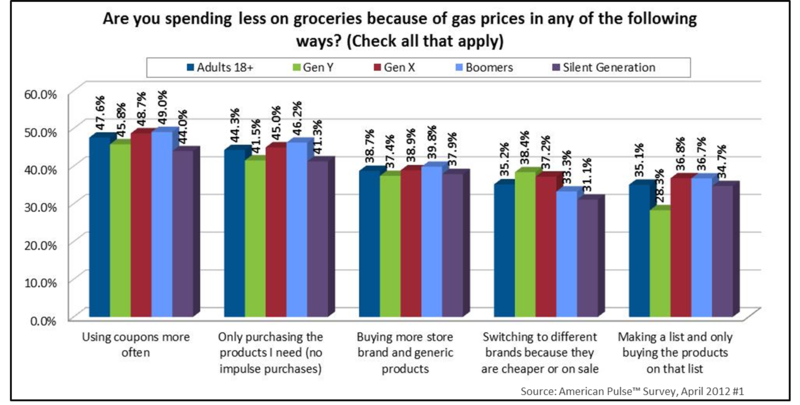 Two out of five Silents and Boomers say that they’ve dropped name brand food products in general, compared to just a third of both Gen X and Gen Y.
I have always heard that you shouldn’t let your gas tank run too low on a regular basis because it’s bad for your car (mostly from my dad). In my 10+ years of driving experience, I have let my gas light come on one time and it was in the last month (yes, dad, I listen to you sometimes). When gas is nearing $4/gallon, I’m just less inclined to pull into a station and fill up. I’d rather figure out how many miles I can drive before it is necessary. I’m also one to gamble – filling up when I see prices drop betting that they won’t be any lower when I really need gas. In this month’s American Pulse survey, we asked consumers what changes they are making regarding their fill-up habits as a result of fluctuating gas prices. More than one-third are filling up less often by letting their tank run close to Empty, just under three in ten are filling up as soon as they see prices drop, and just under one quarter are filling up more often so that the cost isn’t as high each time they go to the pump. When breaking this down by generation, Gen Y-ers are more likely to make changes in general, while this youthful bunch and Gen X are likely the people you will see stranded on the side of the road because they let their tanks get a little too close to empty. If they don’t run out of gas before they get there, consumers are making many different changes when shopping for groceries. Using coupons more often and purchasing only needed products are at the top of the list for Adults 18+. Boomers are the most likely generation to coupon, stay away from impulse purchases, and buy more store brand and generic. Gen Y and Gen X are the most likely to switch to a different brand because they are cheaper or on sale (hint to CPGers: here’s your chance to steal some share). Gen Y shoppers are much less likely to make a list and stick to it, providing room for some in-store promotion to influence their purchases. 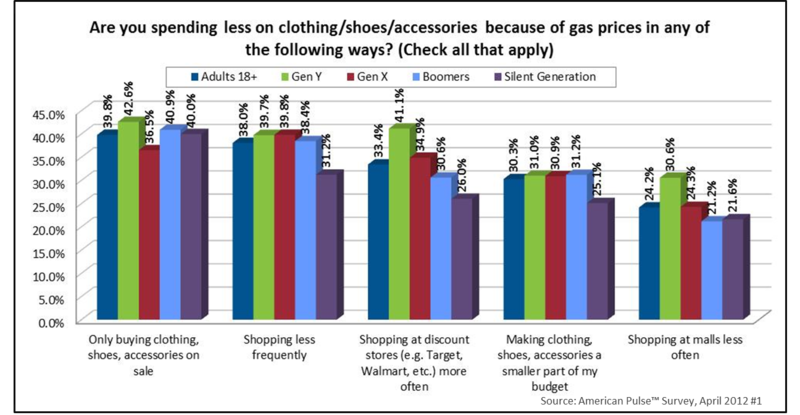 When it comes to clothing, shoes, and accessories, two in five Adults 18+ are only buying sale items because of gas prices. Gen X-ers are least likely to peruse the sale racks while Gen Y-ers are the most likely group to be shopping at discount stores more often and, not surprisingly, shopping at malls less often. More than three in ten Boomers are making clothing, shoes, and accessories a smaller part of their budget. While gas prices have been flirting with the $4/gallon average, I have yet to see the amount of walkers and stranded cars that were abundant when we first saw that mark in the summer of ’08. I keep thinking of the scene from Forrest Gump where he runs across the country with Jackson Browne’s “Running on Empty” playing in the background. It might not be a bad idea for all of us find some good running shoes (on sale, of course) and hit the pavement. I was shopping one of my favorite retailers last weekend–Target. Big Red and I have a history. For years, one of my beloved pastimes is to grab a cinnamon dolce latte from Starbucks and just browse aimlessly up and down the aisles until something interesting lands in my cart. This particular weekend the spirit moved me in the cosmetic aisle and I scored six E.L.F. (Eyes, Lips, Face) items for six bucks. That’s less than how much I usually pay for a tube of mascara! High off of my dollar-a-tube spending spree, I was fairly impressed with my purchase. But then I was quickly deflated when I started to add up the other products that currently have a home on my face. For one, I use a department store foundation ($25), which I have been conditioned to believe that I just cannot live without. Same goes for eye shadow (another $25). 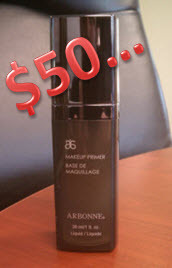 But my latest “big ticket” cosmetic purchase is an Arbonne makeup primer, which with tax and shipping set me back about fifty bucks. So even if I replaced my eyeliner, mascara, lip gloss, blush, powder and concealer with E.L.F. products, I put a grand total of $106 on my face each day. I am a self-admitted make-up junkie, so I spend a bit more on cosmetics than the average Jo(an). According to the BIGinsight™ monthly survey, women spend an average of $16.22 a month on both skin care and cosmetics combined. That equals out to about $195 a year. Women ages 35-44 appear to spend the most, likely due to means or possibly motivation—a wrinkle (gasp!). Women 65+ spend the least. You could probably guess that my favorite place to purchase cosmetics is Target. 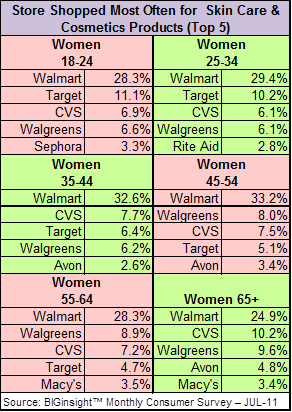 And although Walmart is King Queen when it comes to store shopped most often for skin care and cosmetic products for women of all ages, Target is more likely to crop up in the list among younger sets. Drug stores are also popular choices across the board. Discounters and drug stores are likely popular choices because they carry what a woman wants – at price points most of us ladies can afford. 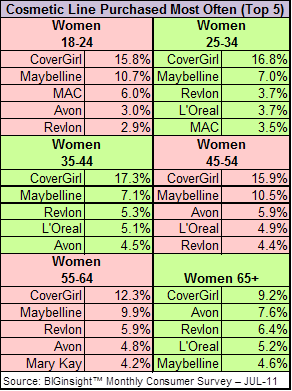 Cover Girl is ranked as the most popular cosmetic line for all age breaks, followed by Maybelline in most instances (women 65+ seem to rely pretty heavily on their Avon lady). Revlon comes in at #3 for women ages 25-34, 35-44 and 55+. Why Are Shoppers So Glum About Spending? As we recently reported in our April BIG Executive Briefing, two in five consumers (39.8%) say they plan to decrease overall spending over the next three months…that was April’s top financial priority, dethroning the usual intent to pay down debt (34.7% in Apr-12). Forty percent actively attempting to curtail their expenditures is a big number. So big, in fact, that we’ve only approached this figure three times in the past SEVEN years. 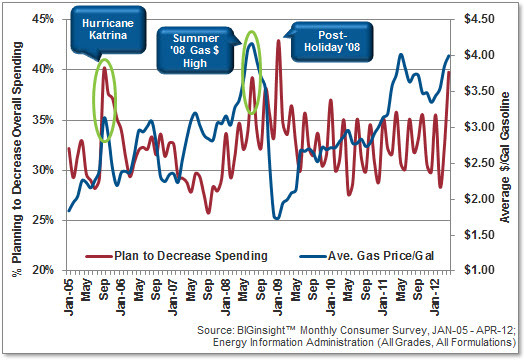 Researching this a bit further, it was pretty easy to tie a piece of history to each of the three previous peaks: Hurricane Katrina, the Summer ’08 Record High Gas Prices, and Holiday ’08 (see chart below, but don’t strain your brain…I’ll break it down in a second). Because two of these three events had at least a little something to do with pump prices, I added in the average price per gallon of gas during the week of our survey collection, as reported by the U.S. Energy Information Administration. Hurricane Katrina: When this natural disaster slammed into the Gulf states in Aug-05, we were all affected nationwide. New Orleans, et al were literally adrift, slow response times left victims with prolonged suffering [*coughs* FEMA], and price per gallon of gas soared to $3 [ah, $3/gal…how I miss thee]. By September, consumers were responding with their spending sentiment: 40.0% were planning to decrease overall expenditures. As you can see in the chart though, as pump prices edged back downward, consumers backed off this conservative fiscal mantra. Holiday ’08: It’s safe to say that the Holiday 2008 shopping season was a disaster. The severe spending cutbacks that materialized with shoppers were not anticipated by retailers, who were left deeply discounting the massive amounts left on their store shelves pre- and post-holiday. More than two in five consumers (42.9%) rang in New Year 2009 with resolutions to decrease overall spending, a record high. So – obviously – it’s not always gas prices that ignite spending cutbacks among consumers…sometimes, you can blame it on a recession. Furthering the point that pump prices aren’t always that culprit, when the cost of fueling up topped off at over $4/gal last May, drivers didn’t have a fiscal knee-jerk reaction. While at the time consumers were bracing for a $4.25/gal price by Memorial Day ’11, that never materialized and plans to decrease overall spending continued to fluctuate in a relatively [new] “normal” 30% to 35% range. So what’s different this year? Average gas prices have crossed that $4/gal threshold again, and 39.8% have responded with plans to cut back. Have consumers just had enough? Are they tired of dealing with pump prices in addition to the inflating price tags on apparel, food, and other household items? Are they not willing to tap into their hard-earned savings to cover the additional costs of fueling up? Are they hedging on a response [or lack thereof] from Capitol Hill? At any rate I think it’s safe to say that if gas prices don’t cool off as summer heats up, retailers might be in for a spending drought. Like the timeline infused with BIG data? Be sure to sign up for complimentary access to our Vital Signs InsightCenter™, an advanced platform for the visualization and delivery of insights and answers on how consumers in the U.S. are reacting to key economic events. It illustrates how consumers feel about the economy, changes they make in their lives in reaction to the economic situation, and how their personal financial and spending plans are affected by key events. It goes beyond traditional point-in-time data reports to trended insights in one easy-to-use, decision-ready format. According to new analysis by BIGinsight, department stores are more buzzed about than discounters when it comes to shopping locales for feminine apparel. * For this special report, we’ve applied the Net Promoter Score** metrics system to our April Consumer Survey data to show how consumers perceive their Women’s Clothing store of choice. Here, we took the percentage of a destination’s detractors from the number of those who actively promote their Women’s store of choice, which helps us evaluate the strength of a retailer’s image for the Women’s Clothing category. And, among the Top 5 stores for this segment, we found that Kohl’s receives the most net positive buzz (NPS = 36.2%) from its customers, followed by Macy’s and JC Penney (see below). While Target’s NPS was significantly lower than its department store counterparts (at 2.6%), the discounter still garnered an overall positive rating. That other big discounter – Walmart – was the only retailer in the Top 5 to calculate a negative NPS (-10.3%)…ouch. It’s interesting to note that while the most buzzed about retailers are department stores by definition, each courts customers based on varying motivations. 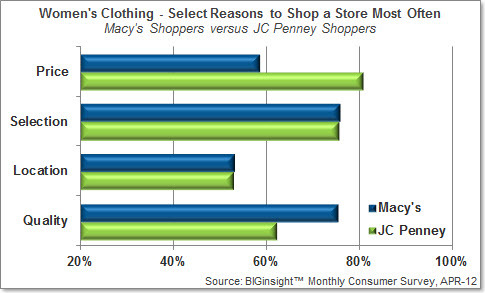 For the Kohl’s and JC Penney shoppers, price and selection are the key reasons to peruse their racks; for Macy’s, it’s quality and selection. At Walmart, customers shop based on price and location, while Target woos shoppers with a mix of price, selection, and location (shoppers seem divided between the latter two). 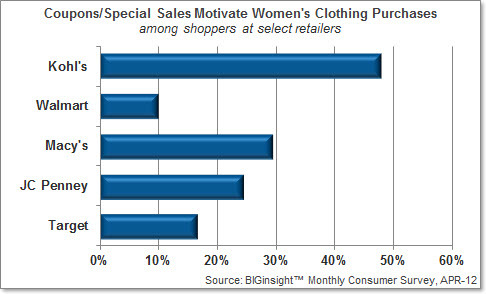 *April 2012’s Top 5 Retailers for Women’s Clothing (Kohl’s, Walmart, Macy’s, JC Penney, Target) were analyzed for this blog.